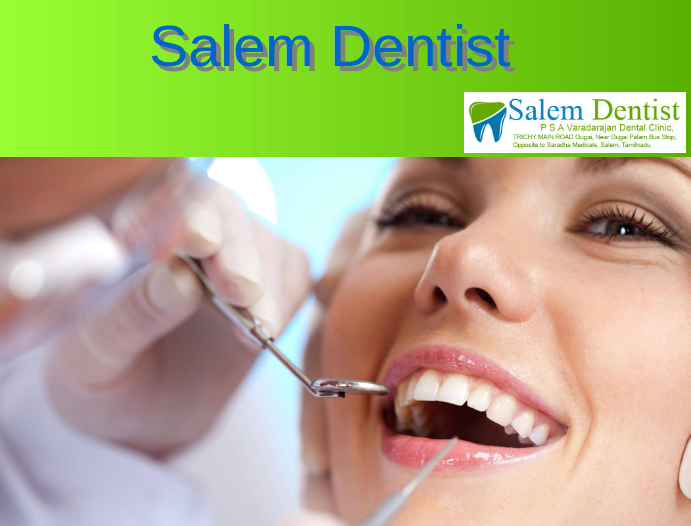 P.S.A Varadarajan Dental Clinic is one of the reputed dental clinics in Salem, Tamilnadu. We are providing an all the advanced techniques in modern dentistry.Our main vision is to deliver the best possible service in order to achieve the best of the patient's health.We have good facilities in both General Dentistry and Speciality Treatments. Our main speciality is we have a good team of a dental experts and dental assistants. Our team of dental experts and other dental assistants are offering you the most modern treatments in a friendly and comfortable environment.We are offering our patients with a world class dental treatment at an affordable cost. Maxillo - Facial Surgery -: Maxillofacial surgery is a specialization of dentistry which focuses on problems around the mouth, jaw, and neck. Pain Managements-: Dental phobia or dental fear referred to the fear of dentistry or fear of getting dental care treatments. General Dentistry -: General dentistry includes all primary dental care like diagnosis, dental treatment, management and overall coordination of services to meet a patient’s oral health needs. Cosmetic Dentistry -: This is a branch of dentistry which is associated to any dental work that improves the appearance (though not necessarily the function) of a person’s teeth, gums and/or bite. Specialty treatments -: Specialty dental care includes routine and advanced dental treatments including cosmetic dentistry. These are the main focus of our clinic.We are always giving importance to routine cleanings, flossing.sealants and fluoride because these are all helpful in preventing dental disease. Good knowledge about the blog. Thanks for sharing this .Keep it .